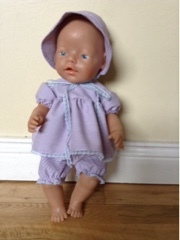 Emily requested a new dress for her baby doll this morning. I didn't quite make a dress, but I hope she'll be happy with baby's new outfit! Emily is going to a party on Monday for the little sister of one of her friends. And this morning I realised I'd no gift. And no little dresses left in my stash. All the dresses I have are age 2-4, and this little girl is only turning one. So out came the sewing machine and a good mix of fabrics. 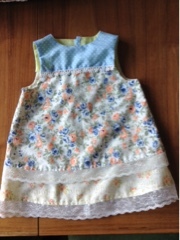 I'd forgotten how much I love making little girls' dresses, mixing colours and patterns. This dress has quite a summer feel in fresh blues and peachy orange. Now if we could just get some summer weather here in Ireland! 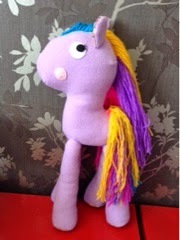 A rainbow pony for a rainbow-tastic day. What a day to be Irish!